Introduction: Journeying back to the domestic offerings, and witnessing the resurrection of former giant in the industry, our Swimbait Rod Wars takes us to Fenwick, a company that was almost lost in the obscurity of so many new competitors in the rod manufacturer landscape. But as we found out at ICAST 2007, Fenwick is poised to retake some of that lost market share with their new and truly technique specific Elite Tech series of rods. Not only do these rods feature blanks with actions custom tailored for specific techniques, their cosmetics follow suit. Submitted for our Swimbait Rod Wars? The seven-foot nine inch ECSWB79H-F.
Impressions: The first thing I checked when our representative from Fenwick arrived was the rod's recommended lure rating. This information was unavailable at the time of writing for our Rod Wars preview article. Three quarters of an ounce up to two ounces is what I found stamped on this rod. A bit of dissapointment to be certain considering most of what we consider to be big baits out here on the West Coast weigh in excess of two ounces! Maybe Fenwick is being overly conservative in their rating? Or is this really just a flipping stick blank labelled as as swimbait rod? There's one way to find out! 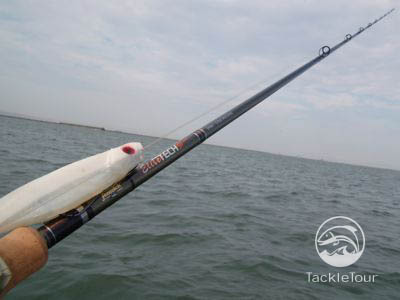 Lab Tests: Off to the RoD WRACK we went to analyze our ECSWB79H-F's deflection characteristics, and what we found was that its behaviour was not unlike that of several other of the lighter weight contenders in our Swimbait Rod Wars. Rate of Deflection (RoD): The ECSWB79H-F shares characteristics with a couple of other sticks in our Rod Wars most notable being both the Kistler KBSBS80 and Dobyns Rods 795ML. It's overall deflection curve is a tad more stout than our previously reviewed Okuma 711MH. 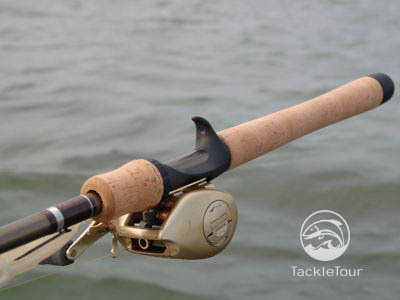 Viewing the rod's taper while in our RoD WRACK with loads up to three pounds, we'd judge it to be a fast tapered rod. Fig. 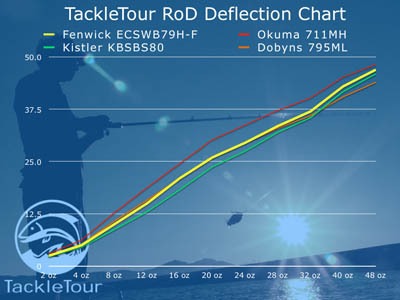 1 : This RoD Deflection Chart shows the deflection characteristics of the Fenwick ECSWB79H-F Swimbait ESC (yellow curve) against several similar sticks. Spine, Weight, and Balance Point: The ECSWB79H-F is among the lightest of our representatives weighing in at only 6.4 ounces. Unfortunately, its balancing point is farily far up the blank at eleven (11) inches from the centerline of its reel seat. We noticed a hard edge on both the left and right side of the blank when searching for the rod's spine suggesting the blank has two.